If you, a friend or family member have any of the following then Vail might work brilliantly for your ski or summer holiday. This is by no means an exhaustive list (it would be impossible to include every condition) but many have similar or common factors. As often someone may have a condition that we have not yet come across please do ask us if you are interested in the resort and we can try to help. For more information on mountain activities in Vail please contact us. The following are delighted to share their experiences with you on how Vail was able to assist and empower them to have a life enhancing winter and ski holiday. If you would like to speak directly with one of our beneficiaries please contact us so we can put you in touch – sometimes sharing a similar condition can be most reassuring especially for first timers! An enquiry came to Ski 2 Freedom in November 2017 regarding a young chap called Paul who is a mid-thigh left leg amputee. He was a semi-professional rugby player prior to losing his leg 4 years ago following a stage 3 diagnosis of a rare form of cancer – Fibrosarcoma. After intensive chemotherapy and amputation he has now been all clear for 3 years and is as active as he can be. Paul had tried a sit-ski in Veysonnaz (Switzerland) but found the lack of freedom frustrating. 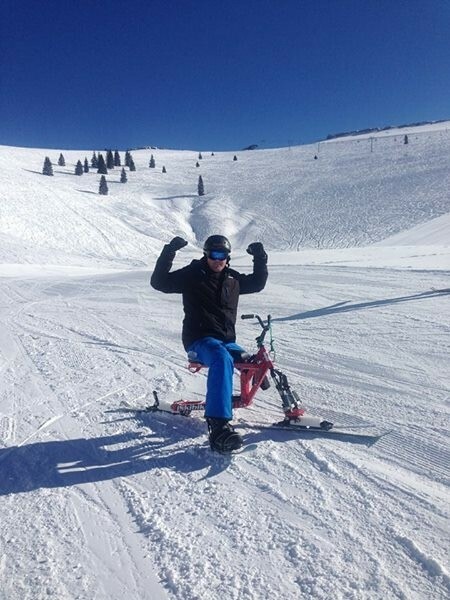 Having been invited to go to Vail (USA), he discovered the absolute freedom of being on the slopes riding a ski-bike. Although common enough on the ski slopes of the US, ski bikes are not so easy to find in Europe, especially Switzerland. *"It was great to use the ski-bike as I had used the sit ski before but felt much more freedom on the bike as I wasn’t strapped in. 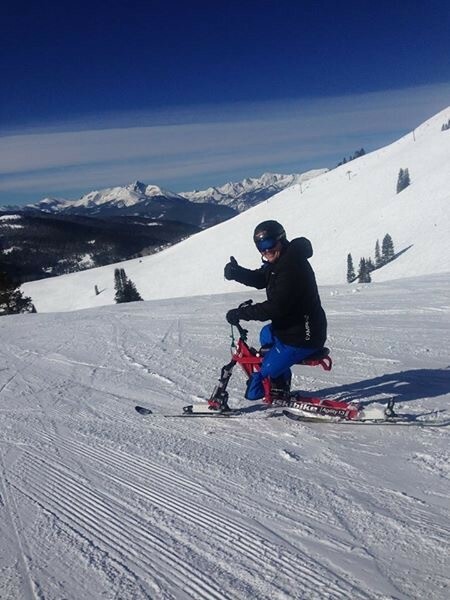 Whilst riding the ski-bike in Vail, I had snow-boarders and skiiers coming up to me all day saying that they wanted to try it and how cool it was! It was exhilarating and I felt like I was having as much fun or even more than the able bodied people skiing and snow-boarding. So in essence I felt fully part of the experience and crucially didn’t feel disabled in the slightest! It was a great release and was extremely liberating and therapeutic. Ski 2 Freedom used its ‘Library of Information’ to send details of where the ski bikes can be used in France and Austria and we look forward to hearing if once again, Paul fulfills his dream of being independent on the ski slopes. We also put him in touch with Dominic Jonas of Active Therapy about skiing 3 track.